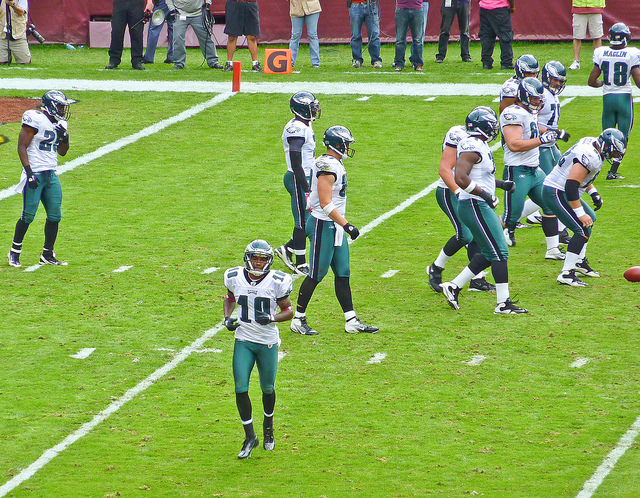 Eagles Cut DeSean Jackson: Gang Affiliation or Contract Conflict? DeSean Jackson, a wide receiver coming off a fantastic 2013 with the Philadelphia Eagles — a season that saw him catch 82 passes for over 1,300 yards and 9 touchdowns — was abruptly let go by the organization earlier this week. The Eagles, who hired new head coach Chip Kelly in the offseason, had been attempting to trade Jackson before a report from NJ.com surfaced, alleging that the Eagles had kept tabs on the receiver and his involvement with a pair of accused gang members who were involved in a fatal 2010 shooting. The news that Jackson had been waived appeared approximately 30 minutes after the NJ.com story was published. While the Eagles didn’t seem to have a problem with Jackson’s affiliations prior to this offseason — according to the story, the franchise had been aware of the relationships since early 2011 — the bright lights that shined on Aaron Hernandez, the New England Patriots Tight End implicated in a gristly homicide last year, have caused teams to reevaluate what they are willing to tolerate in the extracurricular activities of their players. Or, perhaps, Chip Kelly wanted Jackson out. “A bad attitude, an inconsistent work ethic, missed meetings, and a lack of chemistry with head coach Chip Kelly were the original reasons for his fall from grace,” reported NJ.com. The fact that Jackson, who had signed a 5-year, $47 million contract in 2012 was due an unguaranteed $10 million this upcoming season — a sum that made any kind of trade difficult in the event that the team wanted to move on from the player — was not addressed. Jackson’s release will save the Eagles an estimated $26 million dollars in cap space through 2016, per EaglesCap.com. The wide Receiver is in talks with the Washington Redskins, the Buffalo Bills, and the Oakland Raiders, according to Yahoo Sports. There is a distinct possibility that Jackson will make less money in 2013 on his new contract than he would’ve made with the Eagles.